When reading about essential oils – whether you are brand new to essential oils or digging for new recipe blends – you’ll often see a carrier or base oil included in the discussion, or see mention of dilution. So what is a carrier oil, and how do you know which one to get? The carrier oil is a fatty extract, usually cold pressed from its source. Individual allergies aside, a carrier oil is not likely to cause sensitization and therefore makes an excellent medium to disperse the more concentrated essential oil across your skin. 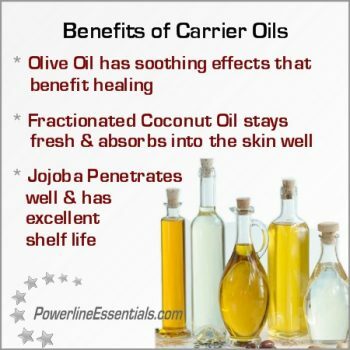 Carrier oils are nutritive and have healing properties of their own, so in your discovery of essential oils, don’t forget to take some time to learn about your options for carrier oils, as well. Before you ask – yes, carrier oils are necessary! Once you get the hang of it, adding your essential oils to a carrier first is hardly any extra work, and in return you are actually amplifying the efficacy of your healing application. The skin may be sensitive to the concentrated oil, distracting the body from the healing benefits that should be taking place. The essential oil may just sit on the surface of the skin, whereas the lipids in a carrier can drive it into the pores. You can’t massage it in or disperse it across wider spaces. An ingested neat oil may cling to the mucous membranes and never make it to the intended site of application. While there are instances when neat is acceptable – gentle oils, or oils under the supervision of a trained aromatherapist – your best bet is to dilute essential oils into a carrier every time. Without essential oils, you will also use carriers as the base of most DIY herbal preparations, from lotion bars to chapstick to salves. Start with the most accessible carrier oils, then work through others as you learn their benefits and ideal uses. Herbal supply stores, health food stores, and online supply shops will offer you dozens of carrier oils to choose from. Don’t get overwhelmed at your options! Carrier oils are relatively simple to understand, and for most preparations, you can’t really go wrong. We’ll walk through the more common of the carrier oils here, but if you run into one you aren’t sure about that isn’t covered here, take the time to look it up and learn what it is and does. Self-education may not teach us everything, but it can take us a long way if we pursue it. The best place to start is at the beginning, and for DIY aromatic and herbal preparations, that’s right in your own kitchen. Really, if we take it back to Hippocrates encouraging us to find our medicine in our food, the kitchen has been the starting point for many generations! Let’s spend a bit of time on these two, as this is likely where you’ll start with carrier oils and diluted topical preparations before branching out to other carrier oils. Olive Oil – Almost undoubtedly in your kitchen, as it is probably the most commonly used culinary and carrier oil out there. Because it is used so much, however, it may be adulterated with similarly-colored sunflower and corn oils. (1) Once again, we are reminded to check our product sources carefully!Extra virgin olive oil – which is cold pressed and minimally processed – is the ideal, and it will be a light green color with a thick scent. Sometimes, the scent can be off-putting, so you’ll want to choose olive oil when making a highly aromatic blend or preparation.In 2015, a double-blind, randomized study took place in which olive oil was used on diabetic patients with ulcers on their feet. After four weeks of treatment, the patients who’d received olive oil topical treatments had smaller, less pronounced ulcers than those who received placebo or nothing. (2) The use of olive oil as a carrier can add to the soothing, healing effects of your dilutions and preparations. Coconut Oil – A saturated fat taken from coconuts, which are actually giant seeds. The oil drives into the skin easily with very little greasy residue, taking the oils you’ve blended in with it. Even without anything blended into it, coconut oil has been shown to enhance the wound healing process. (3) You probably already use coconut oil regularly; its popularity has recently sparked internet jokes about how much you can do with coconut oil: fix your hair, fix your budget, fix your significant other…The jokes, of course are rooted in reality, poking good-natured fun at the almost comical range of things you can do with coconut oil. The way coconut oil is processed will affect its uses. Cold pressed coconut oil (virgin, extra virgin) will retain the coconut scent and will become solid when room temperature or cooler. Heat processed coconut oil will not have the taste and smell of coconut, and fractionated coconut oil (the most processed of the options) will not become solid. The tendency to solidify can be good or bad for your preparations – for quick dilutions, it is sometimes nice to mix up the essential oil into a semi-solid coconut oil and then be able to rub on a quick-melting preparation as it warms to your skin. Fractionated Coconut Oil – Literally a fraction of the coconut oil – being that all of the long chain triglycerides have been removed – fractionated coconut oil is a lightweight emollient that is a must-have for dry or sensitive skin. Also referred to as FCO, It provides an effective barrier without clogging pores and leaves your skin feeling smooth and never greasy. It is considered to be the most cost-effective oil because it will never go rancid. In fact, some suppliers claim that it can be mixed with other (more expensive) carrier oils to extend their shelf life. It is colorless and odorless, and it incorporates perfectly with other oils without altering their scent, appearance or effectiveness. Choose these when: Quick dilutions with what you have on hand; enhancing skin healing; use in a drink or culinary preparation. These oils are probably not in your kitchen for cooking, but they are still very commonly purchased, easy to work with, and rich sources of skin-health nutrients. If you are ready to take a step beyond your pantry, these make a good place to start. Choose these when: Skin is dry or inflamed; nutrients are lacking; versatility and ease of use are desired. Easy to remember thanks to kitchen staples, these oils typically come from the seeds of their respective fruits, as is the case with the other carrier oils. These choices are as affordable and accessible as they are versatile. Apricot Oil – Available as expeller pressed or cold pressed, the difference is simply texture and preference. Apricot oil’s nutrient profile includes vitamins E and A as well, or at least the carotenoid precursor to vitamin A. It is edible as well as beneficial topically. (8)Because it is so incredibly gentle as well as nourishing, apricot oil is a good choice for applications that will cover a good deal of skin or that will be applied on children heavily. Grape Seed Oil – Also a culinary oil, grape seed oil topically is used for its light texture and lack of residue. Once on and in the skin, grape seed is another oil verified for its contributions in wound care and healing. (10) The high levels of fatty acid content and antioxidants in grape seed oil contribute to much of its beneficial composition. (11) Without the heaviness of more saturated oils, grape seed makes a cleaner topical application with less of a greasy film. Choose these when: Creating a massage oil; looking for deep hydration; creating chapsticks and balms.